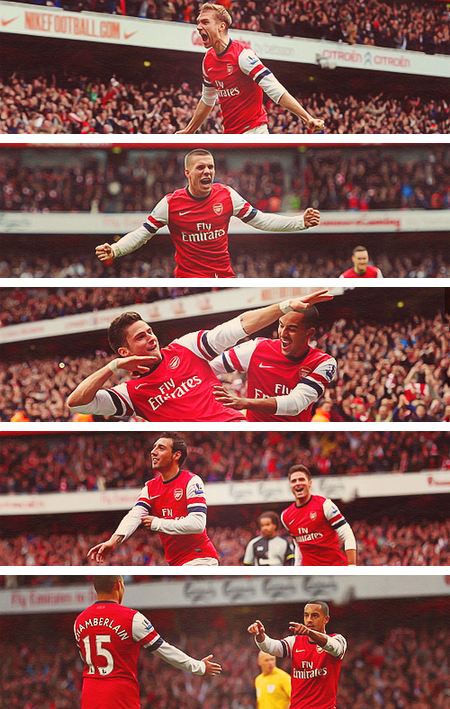 Yesterday, Arsenal came from behind to thump Tottenham Hotspur 5-2. History, it seems, repeats itself. At the heart of matters was the controversial figure of Emmanuel Adebayor, who scored a significant goal only to become the perpetrator of a violent and crude act that will grab the headlines. History, again, repeating. Some say that Adebayor was a little unfortunate to be sent off, and that his fate (a sending off for a thigh-high lunge at Santi Cazorla) could have befallen any player on the field. That would be easier to believe if we hadn’t seen it all before. Adebayor’s previous conviction was, you’ll remember, whilst playing for Manchester City. On that occasion, a goal against his former club fuelled him with such a rush of adrenaline that he stamped on an Arsenal player’s face and celebrated distastefully in front of our fans. On that occasion, punishment was belated, requiring an FA disciplinary panel. Yesterday, retribution was swift and immediate. Howard Webb pulled out the red card, and the game was turned. Spurs had started so well. They fielded an ambitious 4-4-2, and looked sturdy at the back, confident in possession, and threatening on the break. Their goal typified their direct style, borne of a lofted ball down the left that exposed our defence as horribly muddled. Per Mertesacker stepped up while the rest of the back four remained in position, Jermain Defoe raced in to the chasmic gap, and his shot was only palmed in to Adebayor’s path for the simplest of tap-ins. It would be a slight untruth to say the game hinged entirely on Adebayor’s moment of madness. There was another incident, just a couple of minutes before, that was almost as significant. A lightening Tottenham break led by Gareth Bale ended with Aaron Lennon receiving the ball just inside our penalty area. He fizzed a shot across goal, and it escaped the far post by a matter of inches. Had that gone in, Arsenal would have been two down, and the whole shape of the game may have changed. As it was, Lennon missed, and Adebayor followed up with an even greater aberration. Immediately, Arsenal came to life. Santi Cazorla suddenly found the space he’d hitherto lacked, and the game turned in our favour. We were helped, too, by Andre Villas Boas’ selection of the inexperienced Karl Naughton at left-back. He struggled against Theo Walcott all day long, and it was Theo’s perfectly clipped cross that found Per Mertesacker. The big German leapt and planted a beautiful header in to the far corner for his first Arsenal goal. It was a goal that had all the game-changing thump of Bacary Sagna’s in this fixture last season, and Per’s celebration showed just how much it meant to him. Suddenly, Arsenal were flying. In the two minutes before half-time they all but put the game beyond Tottenham. First Lukas Podolski capped a hard-working display by squiring a deflected shot past the otherwise impressive Hugo Lloris, before Olivier Giroud put the icing on the cake. He was helped in no small part by Santi Cazorla, who in one dribble overcame both a foul and a tackle from one of his own team-mates to get to the byline and square for the Frenchman to fire home. At this stage, the half-time whistle brought welcome relief for Tottenham. I turned to a friend and said that with our defence, I wouldn’t be confident until we got a fourth. Fortunately, soon after the restart I got my wish. The goal was possibly my favourite of the day, as it involved all four of our attackers. Olivier Giroud nodded a goal-kick to Theo Walcott, who in turn played in Lukas Podolski. The ruthlessly efficient German squared for Cazorla to slide home a well-deserved goal, and with that the game was pretty much done. Spurs did put a few jitters up us when Gareth Bale fired home from the edge of the area with twenty minutes to go. I have to say, I don’t get many opportunities to watch the Welshman up close, but he’s clearly some player. Fortunately, he’s also far too good for Spurs, so I can’t imagine we’ll have to worry about him there for more than a season or too. With only ten men, Tottenham weren’t ever able to put us under serious pressure. All that was left was for us to replicate last season’s scoreline, which we did in added time. Theo Walcott had been given a four minute cameo in the central role he craves, and he used the opportunity ably to grab a goal, sidefooting home after an impressive burst from substitute Alex Oxlade-Chamberlain. It is genuinely frustrating to watch Walcott in such a rich vein of form, knowing all the time that we are creeping closer to his likely departure. At the moment, however, pragmatism dictates that we must continue to play him. He is simply too valuable to the team to relegate to the bench. For Arsenal, however, there are still plenty of positives. Arsenal’s front six were excellent. In midfield Arteta was solid, whilst Jack Wilshere had arguably his best game since returning from a seventeen month lay-off. Santi Cazorla recaptured his spectacular early-season form, admittedly helped by the holes in midfield left vacant by a fast-tiring Tottenham side. I was particularly taken with the performances of our attacking trio. Theo Walcott and Lukas Podolski could both feel justified in laying claim to a centre-forward role, but both put in real shifts on the flank and reaped the rewards with a goal apiece. Olivier Giroud’s adaptation continues apace – whilst he occasionally lacks pace, his aerial ability and movement generally make up for that. It was notable how many crosses Arsenal put in yesterday – as long as Giroud is in the side, we have a genuine plan B to our conventional ‘tippy-tappy’ style. The truth is that the long term repercussions don’t really matter. In the immediate term, the here and now, we thumped Tottenham 5-2. Feels pretty good, doesn’t it? Just, you could say, like last time. Let’s make this an annual thing. Enjoy your Sunday. As we all know, Arsenal vs Tottenham is more than a game. And yesterday, with an Arsenal side on the verge of crisis hosting a rampant Spurs, it looked to be more than a derby. Fitting then, that what we got in the end was more than a victory. It was a hammering. With 34 minutes gone, it wasn’t looking so clever. Spurs had glided in to a two goal lead; first Louis Saha broke beyond an Arsenal backline more jagged and ugly than one of Aaron Lennon’s eyebrow designs, and his shot deflected off Thomas Vermaelen and over Wojciech Szczesny. Then Gareth Bale fought his way past Kieran Gibbs, and took a self-inflicted tumble over the advancing Szczesny. The referee pointed to the spot, more out of habit than anything else, and Emmanuel Adebayor stroked home his inevitable goal. At this point, I feared the worst. In the short-term, I was worried we would be on the end of a humiliating result. Although we hadn’t played particularly poorly, Spurs looked deadly on the break with the pace of Bale and Walker, and Saha and Adebayor were proving a real handful. It was inevitable we would pour forward in search of a goal, and I feared we’d be picked off on the counter-attack, much like Manchester United were in their 6-1 drubbing at home to City. In the longer term, I wondered if this match might prove to be another nail in the coffin of Arsene Wenger’s tenure. A hefty home defeat to Spurs, off the back of exits from the Champions League and FA Cup, could have turned the tide against him irreparably. The players, it seems, had other ideas. Before the game Arsene said he didn’t feel they’d let him down at Sunderland. I disagree. On that day they weren’t up for a battle; they didn’t fancy a fight. Yesterday was different. Their combative spirit was typified by the goal that got us back in to the game. After Robin van Persie struck a post with a right-footed effort, the ball was kept in play and knocked back to Mikel Arteta. The Spaniard floated a clipped pass to the far post, where Gareth Bale seemed certain to nod the ball away. Instead, he was beaten to it by Bacary Sagna, who launched himself at the ball and headed powerfully beyond Brad Friedel and in to the far corner. It is said that great headed goals depend on two components: delivery and desire. All too often our attempts to score from crosses lack either. This was a rare example of both. In recent years, I haven’t seen too many Arsenal players throw themselves at the ball the way Sagna did yesterday. He didn’t care if he got hurt. He knew what a goal back before half-time would mean, and he wanted it more than every single Tottenham defender. Even he could not possibly have known the avalanche that goal would inspire. Before half-time, we were able to grab the equaliser that turned the game on its head. Of course, it fell to Robin van Persie to turn this way and that on the edge of the box before arcing a beautiful shot around Brad Friedel and in to the back of the net. It was a moment of sheer class. It had struck me before the game that since his evolution in to a penalty-box poacher, RVP has not often found himself with the time and space required to score the wonder goals for which he made his name. Yesterday, in his desperation to drop deep and make things happen, he inadvertently created an opportunity for one of his patented long-range strikes. And what a strike it was. As the second half kicked off, the momentum was firmly with Arsenal. Harry Redknapp made a double change, introducing Sandro and Van der Vaart and switching to 4-3-3 in an effort to stem the time. It served only to weaken Spurs’ attacking threat, and a creaking Tottenham backline found itself coming under wave after wave of Arsenal attacks. In this most unpredictable of games, Arsenal’s third goal had the most unpredictable scorer. Tomas Rosicky picked up the ball about thirty yards out, slid it wide to the onrushing Sagna, and sprinted in to the box to meet the full-back’s cross with a deft finish off the outside of his left boot. Wojciech Szczesny celebrated with a backflip. The Emirates was delirious, and Rosicky relieved. It was his fiftieth game since his last league goal. If Rosicky scoring was a surprise, then so too was what followed: a brace from Theo Walcott. Walcott had been dreadful in the first-half – he seems destined to inherit Andrey Arshavin’s role as the fans’ designated scapegoat – and was probably considered for the hook at the interval. However, he showed tremendous persistence and self-belief to put in a considerably improved second half display. At the heart of his performance were two fantastic goals. First he raced almost the length of the pitch to support Robin van Persie, and lifted the ball neatly over Brad Friedel. Then he beat the offside trap to meet a remarkable lofted pass from Alex Song, and finish expertly across the American. Big goals from a player who has not been a fan favourite of late. Late on, a headless chicken who goes by the name of Scott Parker was sent off for a second bookable offence, and Arsenal were able to see out the game with a bit of keep-ball against ten men whilst ‘Oles’ rang around the Emirates. A remarkable turnaround, and a contender for the most entertaining game in our new stadium’s short history. We’re not out of the woods yet. Amidst the Arsenal fans’ gloating, one song was conspicuous by its absence. Quick though we were to ask Adebayor what the score was, or to remind Spurs they had been two up before collapsing, there was no chant for the man who had masterminded the victory: Arsene Wenger. He got his XI spot on, starting Yossi Benayoun ahead of the more fancied Gervinho and Alex Oxlade-Chamberlain. His recent faith in Tomas Rosicky was vindicated with the Czech’s finest performance in years, and his decision to retain Walcott rewarded with two excellent goals. And yet the 60,000-strong crowd did not see fit to salute Le Boss individually. Perhaps we were too busy taunting our rivals. Or perhaps there’s more to it. Grateful though we all are for yesterday, there is a strong and accurate feeling that redemption is about more than one game. This was the first of three hugely significant league games, which will also take in clashes with Liverpool and Newcastle. The performance yesterday has to be a blueprint for those games, and beyond. If we are to qualify for the Champions League we need to consistently find that level of desire, that degree of determination, and that quality in our play. Each of our goals was expertly taken, and each demonstrated a player prepared to go that extra mile for his team. Each of those five goals gave rise to joy and, crucially, belief. Belief that this is a side who are capable of taking fourth place, ensuring Champions League qualification, and (with the right reinforcements) pushing on beyond that in the year to come. Today marks a year to the day since the Carling Cup Final defeat by Birmingham – a game which signified the beginning of something on an annus horribilis for Arsene’s Arsenal. Let’s hope yesterday’s victory can signify the start of a more enjoyable twelve months. Oh, and Tottenham fans: Mind the gap.